From the four corners of the earth come colourful, inter-connecting stories of humanity living with the wild, unpredictable effects of climate change. Scientists, farmers, oil magnates, climate warriors, prophets, mothers, journalists and others just like you and me – we’re all in the mix and hungry for a recipe of hope. In the struggle over power, some sound the warming bell, some blow hot and cold, while others make a pudding of the planet. Vivid, sharp and deliciously entertaining, BAKED ALASKA serves up the realities of climate change with flair and clarity about the temperatures involved. In the high-energy, ‘seriously funny’ style for which Riding Lights is well known, BAKED ALASKA is something we can all look forward to… unless we do something about it. Extra-ordinary theatre for these extraordinary times. When: 7.30pm, Tuesday 10th November. Buy tickets online. £12 full or £9 concession. 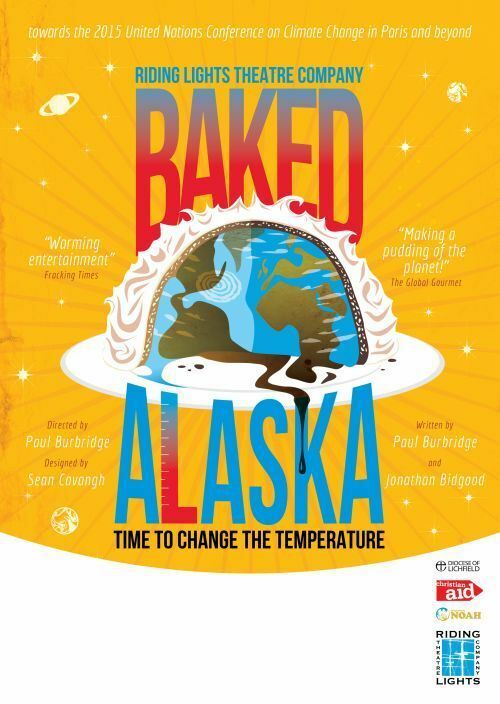 Ahead of the UN Climate Change Conference in Paris, Riding Lights Theatre Company present Baked Alaska, their latest autumn tour delivering a message about our changing planet. This inventive and engaging new show has been commissioned by Christian Aid and Operation Noah to raise a voice for worldwide action on climate change. Inter-connecting stories of the wild and unpredictable effects of climate change from the four corners of the earth are combined into a rich recipe of hope with lashings of vibrant music, high energy storytelling and laughter that will surprise you.